How to Set the Height on a Lawn Mower. Proper lawn maintenance is the key to a lush, healthy-looking lawn. For proper care and to create a lawn that the neighbors envy, you must cut it to the right height; then you can take care of it through mulching, watering and fertilizing. Determine what type of lawn you have. The minimum and recommended height of your grass varies widely depending on the species, but you usually don't want to cut your blades any lower than two inches. Adjust your mower's wheels to your desired setting. Older mowers require that each wheel is lowered or raised individually. Newer models usually have one easy-to-manipulate lever that raises or lowers the chasis in one motion. Either way, start mowing high and adjust lower as you see fit--never adjust to the low settings first. Cut only as often as is required to keep the lawn within the correct height range. If you cut the grass too frequently, not only are you wasting a lot of time on unnecessary lawn care, but you're reducing the health of the grass. Cut your lawn every one to two weeks. You may need to cut more often to maintain the proper height in the spring when grass grows more quickly. Remove only the top third of the lawn in a single cutting; if you remove any more, the health of your lawn suffers. If you miss a mowing or two and your lawn gets too tall, adjust your mower height upwards, cut the grass, then cut it again a few days later at the desired height. Keep your lawn mower height set at the higher end of your grass species' range to prevent weeds from taking hold. A taller, denser lawn prevents many undesirable seeds from taking hold, and you can avoid having to spread expensive and poisonous weed killers. Keep your blades sharp or else your lawn is torn, not cut. This creates brown grass tips and increases the susceptibility of your lawn to fungal infections. 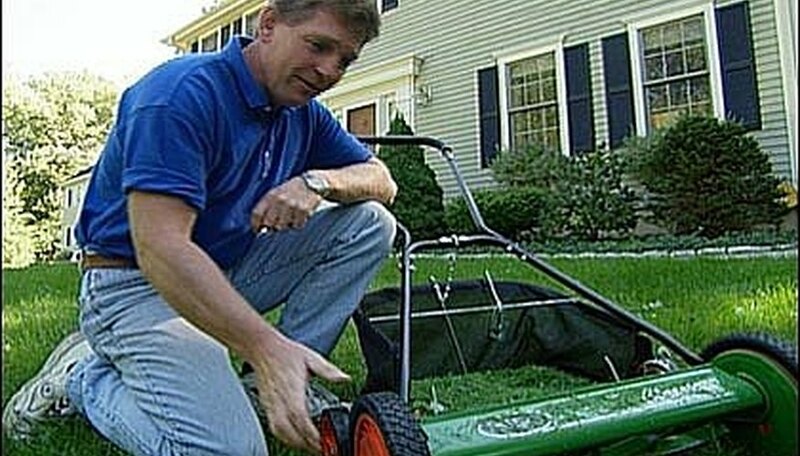 Never scalp your lawn by cutting it too short. Scalping is when you cut the crown, the base of the blade where growth happens, preventing new growth from taking place. Always make sure your mower is shut off when you adjust the wheels. Visit Scott's Lawn Care to learn the proper height of your grass.